Ridler, Jason. "Battle of Beaver Dams". The Canadian Encyclopedia, 15 June 2018, Historica Canada. https://www.thecanadianencyclopedia.ca/en/article/battle-of-beaver-dams. Accessed 25 April 2019. One of the more controversial battles of the War of 1812, the Battle of Beaver Dams established the importance of the guile, professional soldiering, Aboriginal warfare and luck involved in British victory. It occurred during the "see-saw" battles of 1813, in which American forces sought to press their victories on Canadian soil after the successful capture of Fort George in May 1813. On 24 June 1813, almost 500 American troops under Lieutenant-Colonel Charles G. Boerstler were sent from Fort George to harass and encounter Brigadier General Vincent's advanced post near Beaver Dams. Stationed there was one company of the 49th Foot, under the command of Lieutenant James Fitzgibbon. However, a late start and loose talk among Boerstler's men sowed the seeds of Boerstler's defeat. Laura Secord, a Queenston housewife whose husband had been injured during the Battle of Queenston Heights, overheard talk regarding the upcoming American attack. With her husband ailing, Secord trekked over 30 km toward Beaver Dams to warn the British troops, allegedly passing through American lines and at great risk to her safety, until she encountered an Aboriginal camp where she found a guide to lead her the rest of the way. Secord warned Fitzgibbon, but since she had no specifics on the advancing US forces, Fitzgibbon waited for more information. On the 24th, Aboriginal scouts reported the American advance to Captain Dominique Ducharme of the Indian Department. He sent word to Fitzgibbon, and the ambush was on. 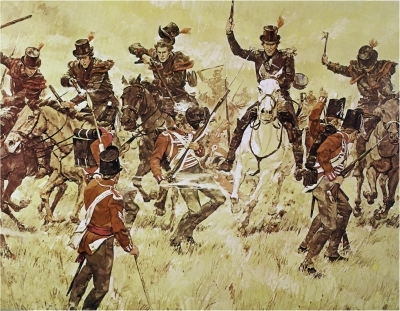 To his great regret, Boerstler was aware that the Aboriginals had spotted him, but pressed on with his advance. A party of 300 Caughnawaga attacked the Americans from the rear along an enclosed, wooded section of the trail near Beaver Dams [Thorold, Ont]. They were soon joined by 100 Mohawk warriors led by Captain William Kerr. After three hours of firing at shadows, the American forces were ready to surrender, but feared what Aboriginal soldiers might do to them as prisoners. Fitzgibbon arrived with 50 soldiers of his own 49th Regiment. 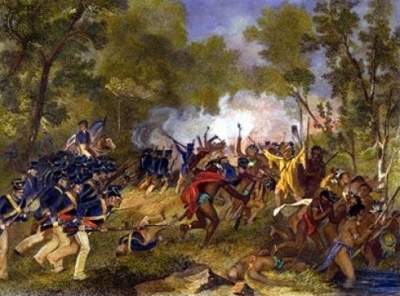 According to Fitzgibbon, he was able to begin the process of surrender in part because of the terror the Aboriginal soldiers had instilled in the Americans, and in part because he had persuaded Boerstler that his own force of fewer than 50 regulars was simply the vanguard of a larger British contingent lurking behind the trees and that, if the fighting continued, it might be impossible to control the savagery of the warriors. Still, it was only when Major P. W. De Haren of the 104th Regiment arrived with large reinforcements that a surrender was formally reached, and by De Haren himself. When the dust settled, 5 Aboriginal chiefs and warriors were said to have been killed, and 20-25 wounded. The Americans suffered 25 dead and 50 injured, including the commander, Boerstler. It was later generally accepted that "the Cognawaga Indians fought the battle, the Mohawks or Six Nations got the plunder, and FitzGibbon got the credit," a slogan attributed to Mohawk leader John Norton, who had fought at Beaver Dams. But Fitzgibbon himself noted that the credit that was his due was in seizing an opportunity for using fear, not bullets, rooted in the successful guerilla tactics of the Aboriginal forces. He wrote, "With respect to the affair with Captain (sic) Boerstler, not a shot was fired on our side by any but the Indians. They beat the American detachment into a state of terror, and the only share I claim is taking advantage of a favourable moment to offer them protection from the tomahawk and scalping knife. The Indian Department did the rest." 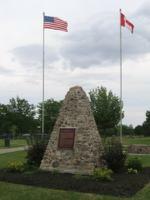 Along with their defeat at Stoney Creek three weeks earlier, the Battle of Beaver Dams left the Americans convinced that they could not safely venture from the protected confines of Fort George, and it led directly to the dismissal of the ailing Major General Henry Dearborn, commander of US forces in Upper Canada, by US Secretary of War John Armstrong. 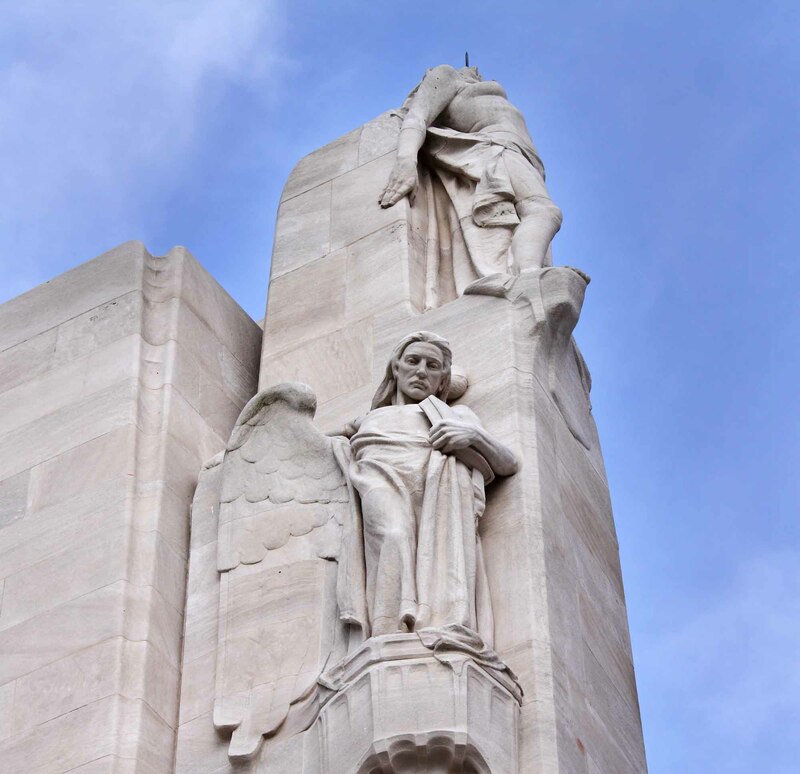 The controversy remains over how much credit for victory should be given to the Aboriginal or British leadership, as well as on how exactly Secord came to hear of the impending American attack. She herself would write many versions of both how she heard of the danger, and how she made her trek, some including the idea of bringing a milk cow and acting as if she was conducting farm business to act as a cover for her true intentions. Regardless, Secord's trek contributed to a decisive British victory in the battle of Beaver Dams. Laura SecordWatch the Heritage Minute about Canadian herione Laura Secord. See also related online learning resources. From Historica Canada.